The word chia had long-standing renown thanks to Chia Pets, a novelty item popular from the mid-1990s to early 2000s. Interestingly, the wholesome seeds were marketed as a package deal with a funny ceramic planter. The ceramic planter is pockmarked with indents in which to insert chia seeds. After watering, the seeds will sprout bushy green and cover the ceramic planter. These planters came in every imaginable shape from former presidents and popular figures of the day to animals. Over the years, chia seeds were recognised as a substance to aid in weight loss. This is because the seeds are hydrophilic, meaning they are attracted to water. The black, tasteless seeds can absorb nine times their weight in water. Normally the seeds are about the size of a poppy seed. When exposed to water, they begin to resemble a gel-like substance (pictured above). As the seeds absorb liquid a bead of gel forms around it. The gel is very difficult to remove from the seed as it is held in place by micro-fibres on the seed shell. The digestive system breaks down the liquid slowly which “keeps the colon hydrated while releasing electrolytes and nutrients.” The detailed process can be seen here. This quality enables the health-conscious to create unusual concoctions, like chia pudding or a natural energy gel. In recent years, chia seeds have taken a firm hold on the health industry. They are slowly being incorporated into baked goods as thickeners and are used to add substance to dishes. Chia seeds irrigate the digestive tract. The unique micro-fibres on the surface of the chia seed bind to the large gel-substance around the seed. The liquids making up the gel are absorbed by the seed making it difficult for the digestive process to break down the soluble fibre. In consuming chia seeds, the digestive tract is guaranteed hydration. As the seeds follow the natural digestion process, they release water. By moistening digested food on its track through digestion, chia seeds can work against constipation. Chia seeds increase satiety and supplement hydration. Thanks to their unique expansion properties, the seeds make you feel full. Though chia seeds are tasteless they are by no means flavourless. When added to smoothies, puddings or yogurts they take on the flavour of the surrounding liquid, making them the perfect addition to your beverage of choice. 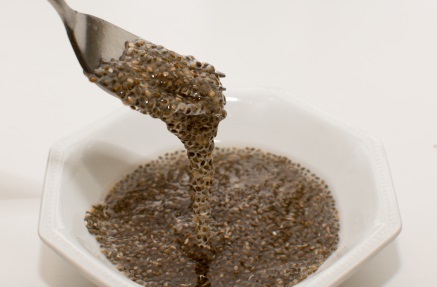 Chia seeds offer two kinds of fibre: soluble and insoluble. Soluble fibre, called “pre-biotic,” feeds “probiotic” bacteria. Feeding the good bacteria helps the body get rid of harmful bacteria. Going by weight, chia seeds are 40% fibre, making them an amazing source of fibre. Almost all the carbohydrates in chia seeds are fibre. This type of carb is not actually digested by the body. It is disposed of, meaning it should not count towards your carbohydrate intake. Chia seeds are full of antioxidants, Omega-3 fatty acids, fibre, protein and calcium. Antioxidants protect the skin against free radicals wreaking havoc on your complexion. Omega-3 and Omega-6 fatty acids can be hard for some people to include in their diet as it is normally found in fish. A couple tablespoons of chia seeds satisfy nearly 30% of the recommended daily intake (RDA) and contain four grams of protein. The same serving contains five times more calcium than milk, 18% of the RDA.